We have teamed up with Leicester Tigers to offer everyone at Dorothy Goodman the opportunity to experience the thrill of a live Aviva Premiership match at Welford Road! 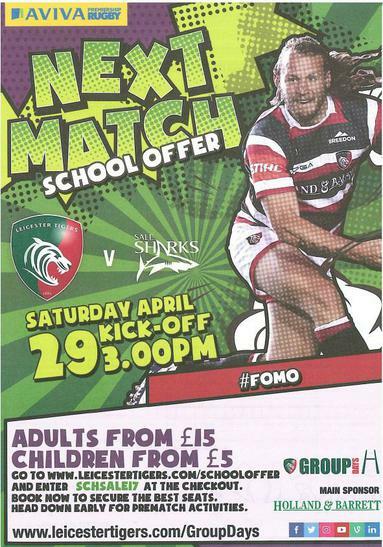 We have been offered tickets to the Leicester Tigers v Sale Sharks game on Saturday April 29th, 3pm kick off, at a special reduced price from £15 for adults and £5 for juniors. Anyone can buy tickets, so get friends and family involved. To purchase tickets online, please book your tickets as normal using the Leicester Tigers website, quoting the code SCHSALE17 at checkout. You can also purchase tickets by completing the booking form which you can download by following the below link. Post the form alongside payment to GROUP DAYS OFFER, Leicester Tigers, Aylestone Road, Leicester, LE2 7TR to arrive before the deadline of Friday, April 21st. Booking forms are also available from the Lower School reception.